Youth Voters Poised to Break Turnout Records in Midterm Election Researchers expect youth voter turnout to break records in Tuesday's midterm elections. And that's important because most attend college in-state, meaning they're voting in their home state. Updated on Nov. 12 at 10:30 a.m.
Efforts to increase youth voter turnout helped, at least according to early estimates. NPR's Brakkton Booker reports that early figures show youth voter turnout in the midterms jumped in 2018. Read below for our original story about why analysts who study youth voters expected this. Opening on-campus early voting sites, installing a practice voting booth with sample ballots and throwing election turnout parties: These are some of the ways college campuses across the country are trying to get students to vote in Tuesday's midterm election. "We have nowhere to go but up," says Nancy Thomas, a researcher who studies college student voter participation at Tufts University. Forty percent of 18- to 29-year-olds say they will "definitely vote" in the 2018 midterm elections, according to the Harvard Institute of Politics' most recent national youth poll. That's compared with 26 percent who said the same in 2014. But just because students say they'll vote doesn't mean they'll actually cast a ballot on Election Day, says John Della Volpe, the institute's director of polling. Still, it's possible youth activism, which Thomas says increased after the 2016 election, will motivate even more students to vote. It has certainly already motivated more young people to register, Della Volpe says. "I think that for the first time, possibly, students are making the connection that if they want to see things change, they can't just protest and rally and fight for their causes," says Zaneeta Daver, director of the All In Campus Democracy Challenge. "They actually need to act. And by acting, I mean participating in elections." This isn't the first election cycle in which colleges are taking an interest in whether their students vote, says Clarissa Unger, leader of the Students Learn Students Vote Coalition, a group that promotes civic engagement on college campuses. "It's not because of the political climate or who is in office now," Unger says. 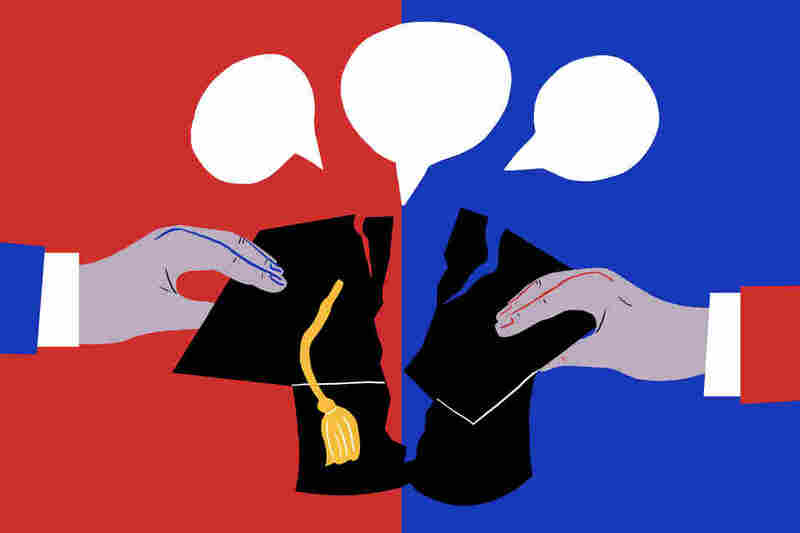 "It is the result of a lot of hard work by higher education associations, nonprofit organizations and researchers that have been working for years to lay the groundwork for high turnout in this election and for many elections to come." Clubs like College Democrats or College Republicans aren't the only options to get involved in politics on campus. Instead, students are gravitating toward issue-based clubs, like Dumbledore's Army, a club where Harry Potter fans discuss social issues, or surfing club, which cleans local beaches, Miller says. "The traditional idea of, you know, 'I'm going to be a Democrat or I'm going to be a Republican because I believe everything Democrats or Republicans believe,' I don't think that resonates with the college voter today," Miller says. Issues are college students' "entry into politics," Miller says, and candidates need to focus on the issues that interest college students if candidates want to capture the younger vote. Colleges can also increase student voter participation by teaching them that they can influence the issues they care about by voting, Miller says. There's also some misconceptions about college student voters. Thomas, from Tufts University's Institute of Democracy and Higher Education, explains a few of them (and why they're wrong). About 85 percent of college students in Tufts' data set (which included about 10 million students in 2016) are voting in the state they attend college. That doesn't mean they're all from the same state as their college, but most are, Thomas says. College students right now are leaning left, but they don't all vote Democrat. Research shows college students come to college with formed ideas, and that attending college isn't likely to move them politically to the left. "They are not these sort of empty vessels where you tip off the top of their head and pour knowledge into it," Thomas says. It's not just today's college kids that vote at low rates. Baby boomers and Generation X, the two generations that preceded millennials, voted at low rates when they were young adults, too, explains Harvard's Della Volpe. "And this generation could change that, frankly," he says.